What sink is best in a small bathroom or powder room? Floor space is limited, so freestanding sinks are ideal as they provide style and function without taking up too much room. A wall-mounted basin comes in a range of styles and materials, so try finding a trendy stainless steel, glass or tile unit for added character. A pedestal sink also takes up minimal space, but as with any small bathroom, storage will be an issue. Be sure to add wall cabinets or shelves, especially if you don't have enough room for a vanity. What bathroom sinks work best for a large bathroom or master bath? Your master suite should be the most luxurious washroom in the house, and a vanity-mounted sink is the best option for both aesthetic and storage. An undermount unit creates a clean, seamless look, and you have the chance to try out different countertop and vanity materials as well. If you have the space, a double console is even better! For the main family bathroom, try an utility or farmhouse sink; this type is often deeper and wider — it also often has two faucets to assist larger families. How do I pick out my bathroom sink material? Although a porcelain unit is often the go-to choice, there are many other options, if you care to venture out. For something that ages well and adds rich color, try copper or bronze. For a slick, modern look, opt for stainless steel, stone or colored glass. And for an interesting, eclectic approach, try a bright tile basin instead. If you're wary of a new material, try a new shape instead. Round, oval, rectangular and square are common options, or you can go custom with a design of your own. 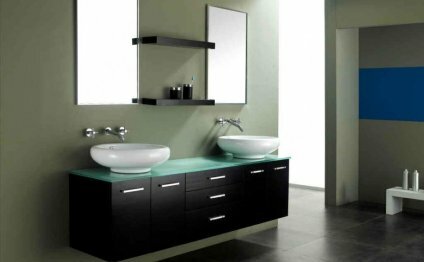 Either way, be sure to consider your bathroom's overall contemporary style and have your sink complement that feel.